The 21st century could very well be named ‘The Age of The Internet’: we use personal devices to browse the web for information, communicate, and showcase our lives via social media. Whilst a lot of films have focused on the internet, few have been set solely on a computer screen (two notable examples being the Unfriended films). I have always thought this to be a trope, something that would never take off or be executed well. I assumed it was merely a crutch for cheap filmmakers with little vision or storytelling ability. But, with Searching, it’s time for me to eat my words; it’s one of the best films of the year and one of the best thrillers of the decade. David Kim (John Cho) is the father to Margot Kim (Michelle La), a new high school student. The morning after Margot goes to an evening study group, David tries to contact her, but Margot does not respond. Soon, he realises that she has gone missing and works with Detective Vick (Debra Messing) to find her. As he uses the internet to try and find her, he uncovers many shocking details about her personal life and soon realises that he does not know his daughter as well as he thought. 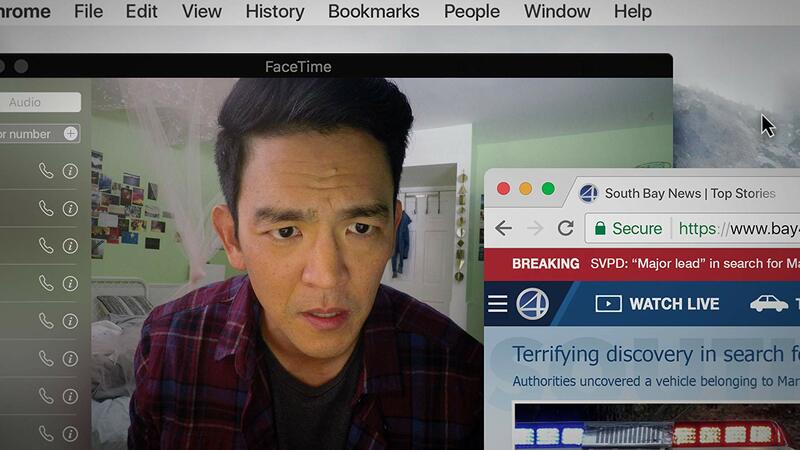 Despite the subject matter being admittedly very cliché, Searching is made thrilling by the storytelling. The pacing is perfect, as the story never feels too long or rushed and there is always something intriguing and intense happening, which is strengthened by the unpredictable plot. It goes in so many different directions that I never truly knew what was going on (don’t go to the bathroom). The final reveal is borderline perfect, paying off a lot of foreshadowing and wrapping the story up on a note that could have been implausible and cheap but ends up being massively satisfying and emotional. Ironically for a film about the internet, Searching’s main theme is miscommunication. The central relationship between Margot and David runs on this theme as well as the mystery itself. There is also a commentary on social media and how people present themselves compared to how they really are. These themes act as the icing on the cake to top off something that could have otherwise been fairly brainless. The most surprising aspect of Searching is just how emotional it is. From the tear-jerking opening, you feel everything the film maker wants you to feel. The family dynamic evokes a lot of empathy, as any parent could relate to the premise as well as the situation that develops at the very beginning. There is also a lot of humour that feels natural and gives some opportunities to alleviate tension. As for the main gimmick of seeing the events through a computer screen, it works wonderfully. Whilst the same story could have been told without this aspect, the plotting is intertwined heavily enough with the internet that it’s reliant upon it. Another strength is, despite mainly being set on one screen, the film makes use of camera angles (mostly closeups) and a score, which prevent visual repetition or boredom. Searching’s use of this helped it be 100 times more thrilling than any number of regularly filmed thrillers that were handled with incompetence (like The First Purge or Breaking In). John Cho’s performance anchors much of the film. Typically known for comedic roles, his turn to dramatics is completely convincing as an average guy thrust into a situation he cannot deal with. His performance is made more effective by the distance that the screen interface creates. Despite rarely seeing his face or hearing his voice, his presence is continually felt. Debra Messing is also strong as the detective, making a great foil to Cho’s David and defying my expectations. Searching is an engrossing mystery thriller that uses its technique to fantastic effect. Whilst I can unfortunately see this being abused and misused in the future, Searching will most likely be the definitive way of using it effectively. Despite being told through a computer, it is easily one of the best films you will see all year.